Smashing Pumpkins founder, mastermind, and only constant member, Billy Corgan once described the sound of his band — then at the height of their commercial and visionary powers — as “psychedelic music by a heavy metal band from the 1920s.” While the nod to the ‘20s had more to do with the band’s penchant for art nouveau typefaces and the anachronistic aesthetic of the Mellon Collie and the Infinite Sadness artwork — rococo grandeur meets absinthe-induced collage art — the psychedelic metal band sound, with occasional forays into thematic prog rock, electronic music and goth-tinged dream pop, has consistently defined the Chicago band through their many incarnations. This has much to do with the gear they’ve used. Billy Corgan and guitarist James Iha first started playing music together in 1988 with a drum machine. 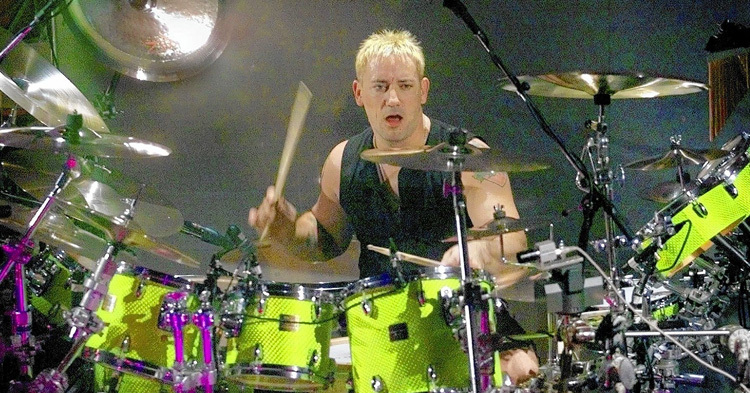 They were soon joined by bassist D’Arcy Wretzky and then drummer Jimmy Chamberlin. The band’s first run (minus an album without Chamberlin and Wretsky’s departure in 1999) ended where it began, with a farewell performance in Chicago, at Cabaret Metro in 2000. Since reviving the band name in 2005, Corgan has toured and recorded with a rotating lineup of musicians. Billy Corgan’s first guitar was a red Fender Mustang, which he used with the Pumpkins in the late ‘80s after the dissolution of his first band, The Marked. “I sold all my pedals and gave up playing distorted guitar for a long time … I concentrated on writing songs with my Mustang and Fender amp.” Then, just as Fender’s marketing department intended, Corgan graduated from the student model to Stratocasters. “If you said, ‘What’s the guitar you’d want to be buried with?’ I’d have to say the Bat Strat. It’s just beat to living hell,” Corgan said. The Bat Strat is an early ‘90s ‘57 Reissue Stratocaster painted silver and decorated with bats. Corgan has also played a 1974 Strat, a 1975 Strat, a 1978 Strat and an Eric Clapton Signature Strat fitted with Lace Sensor pickups. He later used a 1972 Gibson ES-335 during the recording and touring for Mellon Collie. “It’s the only non-Strat guitar I really enjoy playing,” Corgan said. During the Adore years, with Chamberlin’s powerful drumming missing from band, Corgan branched out and played a 1971 Fender Jaguar, a Fernandes Decade Elite, a Hamer Californian CX42 and an Ibanez RG7621. Since then he’s also played a variety of Gibsons, including a 1978 Gibson Les Paul Special during the Machina tour, a 1962 Gibson SG Special and a 1972 Gibson Firebird while touring for Oceania. Billy Corgan’s signature sound, as most listeners will recognize it, boils down to a simple formula: Marshall JCM800 head, a 4x12 Marshall cab, an Electro Harmonix V4 Op-Amp Big Muff Pi and a Fender Stratocaster. “The sound of the combo of the Bat Strat, the Big Muff, and Soul head with Mars cabinet is still unmistakable,” Corgan said. After Jimmy Chamberlin replaced the drum machine, Corgan replaced his Roland Jazz Chorus with a used Marshall JCM800 head and a Marshall 4x12 slant cab, which he found in a newspaper ad back in the days before Reverb. The 1984 Marshall 100 watt JCM800 head with the EL-34 tubes swapped for KT88s, (the “Soul” head) matched with the Marshall 4x12 cab (the “Mars” cab) was the dominant amplifier sound on the Pumpkins’ first three albums, Gish, Siamese Dream, and Mellon Collie and the Infinite Sadness. Corgan also used a Marshall JPM-1 preamp into an Alesis compressor with a Mesa Boogie head. 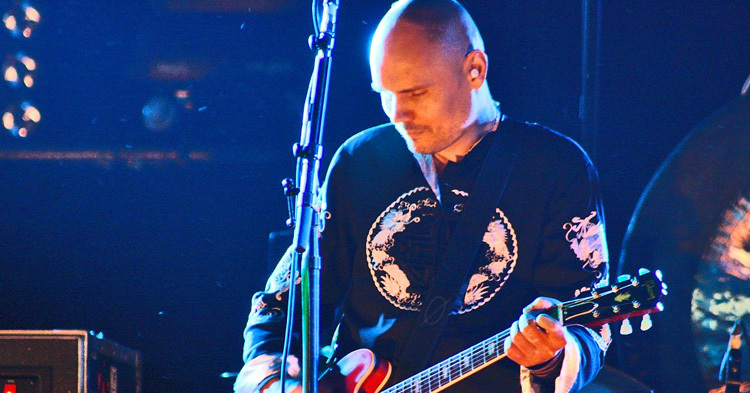 Corgan has recorded and toured with Laneys, a Silverface Fender Bassman, Selmer amps, Orange amps and a 1964 Vox AC30. Corgan’s affinity for the highly-produced ambitious rock albums of the 1970s lead him to experiment with an extensive arsenal of pedals and studio effects, but there a few key units that listeners will associate with his Pumpkins work. The most important effect in Corgan’s career is undoubtedly the Electro-Harmonix late-70s Op-Amp Big Muff that he first used on Gish and most notably throughout Siamese Dream for the crushing walls of overdubbed fuzz guitar. Unlike other iterations of the Big Muff Pi, the V4/V5 Big Muffs used Operational Amplifiers instead of Transistors for a harsher distortion sound. In the studio, Billy paired the Big Muff with an MXR Distortion II for extra drive. For modulation, Corgan has employed a myriad of phasers for subtle movement and lush psychedelic sweeping. His phasers have included MXR Phase 90s, MXR Phase 100s, an Electro-Harmonix Bad Stone, a Maestro PS-1A and most importantly a Mu-Tron Bi-Phase, which Siamese Dream producer Butch Vig said “is one of the secrets to our secret sound … We run everything through it.” More recently Corgan has used boutique delays such as a Skreddy Echo and a Strymon El Capistan. 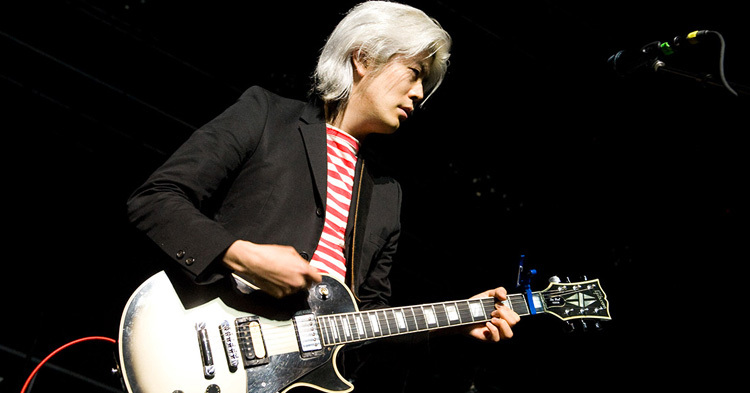 James Iha was the co-founder of the Smashing Pumpkins, and in the early new wave days of the band Iha played a Fender Telecaster and occasionally a Fender Bronco during the Gish and Siamese Dream years, but his guitar work with the Pumpkins is largely defined by a variety of Gibsons, including a 1984 Gibson Les Paul Custom, an ‘80s Silverburst Les Paul, a 1994 Red Gloss Flying V, and a 1991 30th Anniversary SG. Iha got his first Les Paul Custom in 1991 before the band recorded Gish, and the dynamic of Billy’s Strat and Iha’s Les Paul was a mainstay for the band’s live shows and post-Gish recording. In the band’s music videos, however, Iha would often appear without Les Pauls, selecting a Fender Telecaster (“The Everlasting Gaze”), a Fender Jazzmaster (“Zero”) and a Teisco K-2L (“Rocket”). Jeff Schroeder, Iha’s 2007 replacement, typically plays a Gibson to counter to Billy’s strats, as well as few Fenders. On the band’s first few albums, most of the Corgan and Iha’s guitars were run through the JCM800 Soul/Mars combo (with different speakers mic’d), but Iha also used an Orange OD120 Overdrive Head and Cab, a Mesa Boogie TriAxis preamp and a Silverface Fender Twin Reverb. James Iha and Corgan shared many of their pedals in the studio and even live. As Corgan remembers of their first Big Muff: “We only had one of these in the beginning and James and I used to take turns over who would use it on a given night.” Live, James Iha used an Ebow to add wailing drone to songs like “Soma,” “Drown,” and “Porcelina of the Vast Oceans.” Iha also favored phasers and had a V2 Small Stone taped onto the body of his Flying V at one point. Iha used a Digitech Whammy II live during the recording and touring for Mellon Collie. Iha’s special effect you won’t find on Reverb is the Lazertag Starhelmet and Lazer Gun that Iha used to hold up to his guitar’s pickups for sci-fi battle sounds in the 1994 Vieuphoria VHS/DVD. 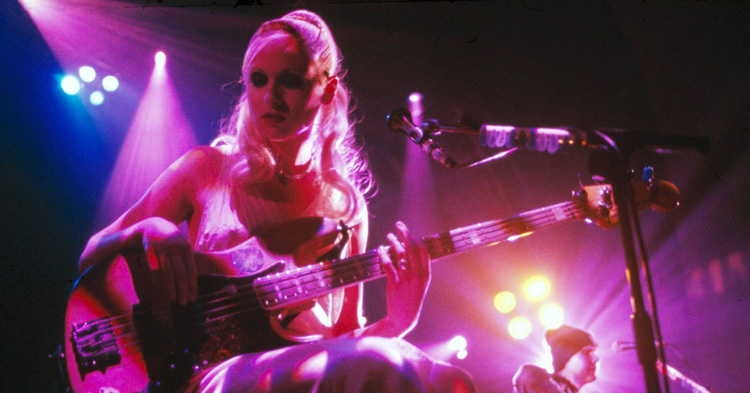 D’arcy Wretzky, the Pumpkins’ first bassist, was originally trained on violin and landed in Chicago after a failed attempt to join a band in France. Wretzky sang on a handful of Pumpkins songs and allegedly recorded many backing vocals for Mellon Collie, most of which were scrapped. Wretzky started out playing a Yamaha BB3300 and a Musicman Stingray bass, but eventually gravitated toward Fender Jazz and P-basses. Wretzsky quit the band in 1999 ostensibly to pursue acting. When Hole bassist Melissa Auf der Maur took over Wretzky’s duties for the final year of the Pumpkins’ first run, she too used a Fender P-bass, as did Pumpkins’ bassist Ginger Pooley (2007-2010). Nicole Fiorentino played a ‘58 and a ‘76 Fender P-Bass as well as a ‘63 Fender Jazz bass during her four year run in the Pumpkins (2010-2014). During the Gish years she used Trace Elliot amp heads and cabs to compete with the walls of guitar noise. “I play through a Trace Elliot, so I can cut through all of them,” she told Guitar World in 1992. Wretzky later used Mesa Boogie amplification. Jimmy Chamberlin was originally trained as a jazz drummer and his elegant but commanding playing has pushed the band to new heights throughout their career. Chamberlin was the only original member to return to the band when Billy Corgan took out a full-page ad in the both the Chicago Tribune and the Chicago Sun-Times saying that he wanted to reform the Smashing Pumpkins. Chamberlin has been in and out of the group, but most recently toured with the band for the The End Times tour this past summer with Marilyn Manson. Gish and Siamese Dream are widely believed to have been recorded by Corgan and Chamberlin alone. Chamberlin was playing a yellow Pearl kit when he joined the band, but throughout the ‘90s he preferred Yamaha kits with Sabian cymbals. When he rejoined the band in 1998, he began using Zildjian cymbals. Chamberlin has provided fans with thorough diagrams of his various kits on his website. In 2011 Jimmy made the switch from Yamaha drums to Drum Workshop. “After 18 years at Yamaha I have decided to move on. I feel that DW is the company that can take me, and my evolution as an artist, to the next level,” he said. Then in 2015, when he rejoined the Pumpkins, he made the switch to Sakae drums. “They are without a doubt, the finest instruments that I have ever played,” he said. “Unbelievable tone and focused attack and just beautifully even across the board. When I played this kit I felt like I had come home to where I belong. So much of this sound is a part of me. Everything about the way that I hear drums is contained in these instruments.” He uses Vic Firth American Classic 5B wood-tipped sticks.